I love the flavours in this dish. You can’t beat cream cheese, garlic and tomatoes. In fact, I often make extra of the cheese filling to dollop over leftover pasta. It melts beautifully in the microwave and makes a brilliant sauce in its own right. I don’t know why it has taken me so long to post this recipe as I’m sure I have made it several times before but here it finally is. I served it with gnocchi last night and the sauce in that recipe makes an excellent accompanyment whether you choose to serve it with gnocchi or pasta. – Use a sharp knife to split the chicken breasts along one side to make a pocket. – Place the chicken breasts side by side in a baking dish. – In a bowl mix together the garlic, sundried tomatoes, cheese and creme fraiche. Mix well. – Spoon 1/4 of the cheese mixture into each pocket in the chicken. Poke it in well. 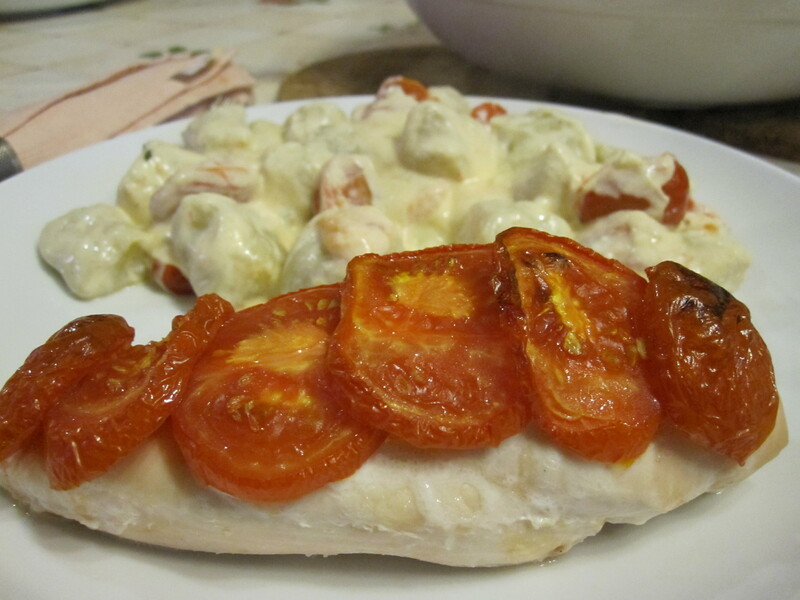 – Place one of the sliced tomatoes on top of each chicken breast and spray with a little oil. – Cook for 30 minutes in the oven until the tomato is just starting to colour a little. – Serve with whatever accompanyments you like, see Gnocchi for ideas.